ESTE PRODUTO REQUER O JOGO BASE Anno 2070. In this brand new World Event, Global Trust and the Eden Initiative reach a deadlock. The conflict of interest increases and both try to win the player over for themselves. The impartial E.V.E. suggests choosing a neutral position and growing a population of diplomats to commence proceedings. Get direct access to both factions to bring peace to the rivaling parties and study a brand new weapon – the nuclear submarine. In the course of three missions you will gain access to this powerful weapon, enabling you to fire long-range missiles from the depth of the sea. 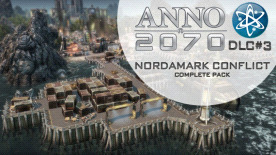 The Nordamark Series Package: The storm clouds of war are darkening the world of Anno 2070™, but the new ornamentals give you the power to rule over light and darkness. The brand-new lighthouse enables you to influence the time of day for the first time in Anno’s history. Experience your metropolises in a brand-new atmosphere and enjoy fascinating light settings. Let dawn break or night reign over your island world. Additionally, there are new ways of customizing your harbors with various containers and cranes. © 2012 Ubisoft Entertainment. All Rights Reserved. Anno 2070, Ubisoft and the Ubisoft logo are trademarks of Ubisoft Entertainment in the US and/or other countries. Produced by Blue Byte. Blue Byte and the Blue Byte logo are trademarks of Red Storm Entertainment in the US and/or other countries. Red Storm Entertainment Inc. is a Ubisoft Entertainment company.